For working adults and full-time students alike, the online MBA program at West Chester University aims to revolutionize the world of business education. Students have a number of reasons for wanting to obtain an MBA. Maybe they wish to earn a higher salary. Perhaps they believe it can increase their odds of receiving an important promotion. Or maybe they’re looking to gain the vital business skills needed to start an enterprise of their own making. Unfortunately, people often find reasons not to pursue this dream. It will take too much time, they believe, or cost too much money, or interfere with their existing commitments. That’s not the case at West Chester University (WCU), where students of all ages, means, and backgrounds discover a solution designed to remove these obstacles: a fully online MBA program that has received local, national, and international acclaim. 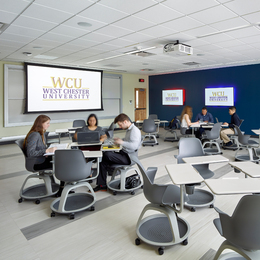 WCU’s MBA program began life as a hybrid, meaning it included online and on-campus classes. Although students could complete a fully online degree as far back as 2011, in 2016 the program moved from offering hybrid courses and transitioned to fully online as a way to meet nationwide demand from a growing population of adults looking to further their careers through education. The MBA program has been accredited by AACSB International (AACSB), a global nonprofit organization dedicated to recognizing meritorious business education programs around the world. Fewer than 5 percent of the world's 13,000 business programs have earned this accreditation. Flexibility in terms of scheduling classwork ranks among the program’s greatest benefits. While students do have certain assignment deadlines to meet, students do not have to be at their computers at any set time of day. Such flexibility extends to the number of courses a student can take each year, too. Each online class is seven weeks long, during which students can earn three graduate-level course credits. While most students take one course at a time, which sets them up to complete the full MBA program in just two years, Halsey says a full-time student can complete the program in as little as 10 months. This speaks to one of the greatest strengths of WCU’s online MBA program: an innate sense of community, including alumni who continue to add value to the program as guest speakers or panel participants. One such opportunity is a business idea competition sponsored by the Dr. Edwin Cottrell Entrepreneurial Leadership Center, through which alumni serve as either judges or mentors. Halsey suggests students will have a tough time finding an MBA program that offers a comparable experience in terms of complexity, convenience, and overall value. Because WCU is a state university, tuition rates are, in his words, “exceptionally low,” especially for a school with AACSB accreditation. To learn more about the online MBA program or to apply, visit WCUpa.edu/onlineMBA.